If you and your large group like rushing water and roller coaster rides, then white water rafting may be exactly what you are looking for in a large group activity. White water rafting in Gatlinburg is a thrilling experience for groups of all sizes and is a once in a lifetime experience that you and your group are not going to want to miss out on. You and your group will have an exciting trip down the Pigeon River as you go through the rapids and twists and turns of the river. Here are a few tips that will help make your white water rafting in Gatlinburg trip with a large group even easier. During the spring and summer the water is running on the Pigeon River 3 to 4 days a week. On each of these days the river is full of people wanting to enjoy their time white water rafting in Gatlinburg. To guarantee your spot on the river during your trip to Gatlinburg it is important for you to make a Gatlinburg white water rafting reservation beforehand. Even if it is only a couple of days before your white water rafting trip it will prepare the rafting outfitters for your group, ensuring that they will have availability for your group and that all the supplies needed for your group is available. Coming prepared for white water rafting in Gatlinburg is essential for you and your large group to enjoy your time rafting down the Pigeon River. Most importantly is knowing how to dress during your trip. Check the weather before you go out that day, that way you know if you need to bring warmer clothes, rain gear, or to just wear a bathing suit, shoes and a life jacket. That also brings us to shoes, all shoes going down the river should have backs on them that way you reduce the chance of losing your shoes during your ride down the river. Finally, make sure all of the forms that you can fill out before hand are filled out before you get to the white water rafting location, that way you and your group can get started on your trip down the river quicker. On the Pigeon River there is 3 different white water rafting in Gatlinburg difficulty levels, so depending on how adventurous your group is and how old they are will determine which part of the river you and your large group will want to do. Below are each of the trips we offer so you can consider which trip will be best for your group. The Lower Pigeon River is a great trip for all age. The Lower Pigeon River is a 5 ½ mile ride trip through the scenic Pigeon River gorge. This river will run you and your group over class 1 and 2 rapids and 1 class 3 rapid. The Lower Pigeon River will allow everyone over the age of 3 to get to enjoy rafting down the river while engaging in water flights and splashing. For groups that are a bit older the Upper Pigeon River may be exactly what you are looking for. 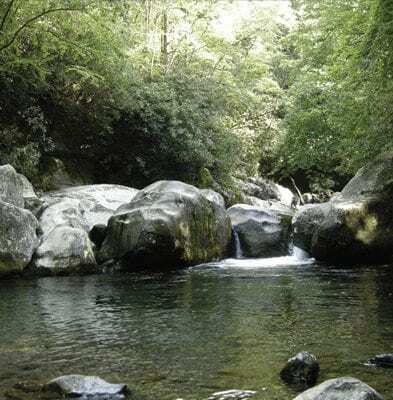 This exciting 6.5 mile trip goes down class 3 and 4 rapids through the Smoky Mountains, making this one of the most exciting trips on the river. For this part of the river rafters must be 8 years or older or 70 pounds. For the most adventurous of groups the Upper Pigeon River offers an Upper Pigeon Extreme version. This extreme version puts rafters in a small raft while a guide has the raft hit the big waves and gives you the opportunity to surf the waves on the river. For this trip participants must be 12 or older and have the ability to swim. Knowing how to prepare before your white water rafting in Gatlinburg experience will help make your trip much more memorable as you raft through unpreparable rapids. To help make your white water rafting in Gatlinburg experience even more amazing check out this white water rafting in Gatlinburg group information to learn more about white water rafting in Gatlinburg.